Nate and Jessie Rogers grow grains and keep a small herd of Jersey cows at their farm on the Dog River in Berlin, Vermont. They grow, harvest, and mill their own grain, and they sell their whole wheat flour, rolled oats, and milk on Saturdays at the Montpelier Farmers’ Market and at their farm stand. The main climate change issue the Rogers have experienced is river flooding caused by heavy rains. They bought their farm four years ago after the property was flooded during Tropical Storm Irene. The farm has one mile of river frontage and the fields were completely flooded, the house was damaged, and the previous owners had to go out of business. A foot of sand had to be removed to restore the fields and a two-acre chunk of land washed away. 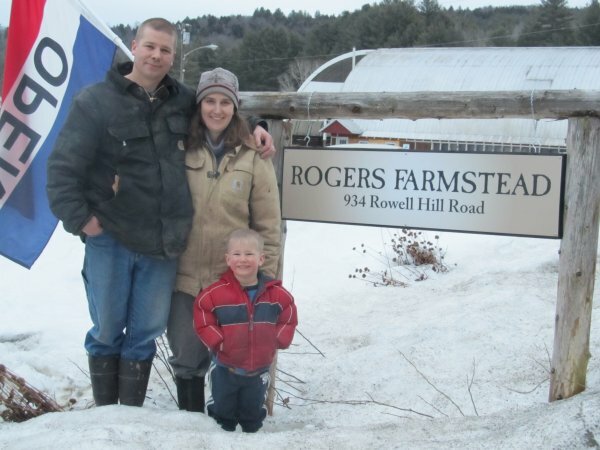 When Nate and Jessie first moved to the farm, they wondered if they should fill the horseshoe-shaped area back in, but decided against it after consulting with scientists from the Vermont Agency of Natural Resources (ANR). This loss of land also eventually led to work with The Vermont Land Trust, who offered to purchase a river corridor easement from them, in effect paying them to take some of their cropland out of use. With the erosive nature of their soil and the susceptibility of their fields to flood damage, they decided to accept the easement. The easement is fifty feet wide and centered on the middle of the river channel. They can’t farm the land that is within the easement, but they can plant trees in this corridor to stabilize the riverbanks. Outside of the easement, the Rogers have planted all their river fields in grasses and perennial crops to keep the soil covered and keep it from washing away. This means they have 20 acres of river fields that they can’t use as part of their rotation for grains, but is still in some sort of agricultural production and also addresses their bigger concern of soil loss and downstream water quality. They see the importance of water quality, and work with the Natural Resources Conservation Service (NRCS) and the ANR to make sure they have a healthy river that can function properly, while they still farm the land.